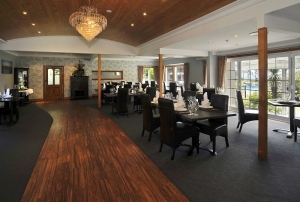 Fine Dining in Rotorua centres around the larger hotels, or out of the way resorts. There are sumptuous menus to try, if you have the money, so if you're the indulgent sort, just ask at wherever you're staying, for some local recommendations. Rotorua Fine Dining is a growing market, thanks to the expansion of luxury spas and resort-style hotels in the area. The more discerning visitor to the city will want to finish off their evening in style with a luxury meal, so there are more and more fine dining establishments opening up around town. The big hotels up by Lake Rotorua, all have very good fine dining restaurants, which are open to non-residents. Staying in town, the north end of Tutanekai Street, away from the motel strip of Fenton Street, is where you'll find the more high end eateries, especially around Pukaki Street and Whakaue Street. Further east, try Holdens Bay for a romantic, candlelit dinner. North, head to Kawaha Point and Fairy Springs for something even more intimate. Around Rotorua there are also some exclusive resorts which will always have an accompanying fine dining restaurant attached.